You’ve found your dream home and are now ready to start shopping for a mortgage. Several lenders have talked about points. Points, also called discount points or origination fees, are each worth one percent of the loan amount. Paying points basically allows the borrower to buy down the interest rate. They are paid to the lender at closing. You’ve heard that paying points is the only way to get a low interest rate. But is increasing your initial costs worth getting a lower rate? For most people, paying points doesn’t make sense. Points became popular in the early 1980s when mortgage rates were in excess of 15%. Most people could not afford the monthly payments that come with such high interest rates. Lenders began offering discounted rates at a certain fee. Sellers often paid the points in order to sell their properties. This gave buyers affordable mortgages and owners were able to sell their homes. Times are different now. Interest rates are low. There isn’t a large need to pay a lot of money up front in order to get a lower rate. Let’s look at the numbers. You have contracted to purchase a home for $450,000. You have the 20% down, which leaves you with a mortgage of $360,000. You find a 30-year fixed rate mortgage at 3.50% with one point. For closing, you will need to pay an additional $3,600 ($360,000 x 1%) for the point. The lender can also offer you a rate of 3.75% with no points. What do you choose? The lower rate or the lower closing? At 3.50% you will have a monthly principal and interest payment of $1,616. At 3.75% your payment increases to $1,667 each month. That’s a difference of $51 per month. If you are looking for a monthly payment reduction, that’s not really a significant one. It will take you 70 months ($3,600 divided by $51) to recoup your one point payment at closing in the form of a lower monthly payment. This is your payback period. But if you had the $3,600 still, it could be earning interest elsewhere. If it gets 3% interest in another investment, it would earn about $9 per month. If you pay points, this is interest lost, so subtract $9 from your $51 per month savings. Now divide $42 into $3,600, and your payback period increases to 85 months — seven years. So you have to live in your home for at least seven years in order to take advantage of the savings that paying points gives you. Most people don’t keep a mortgage for seven years. Whether through sale to move up or elsewhere or refinance for cash out or lower rates, the average American keeps their mortgage for six years. Unless you are absolutely sure you will live in the home for the time period necessary to recoup your points, you should probably invest your money instead of putting it towards points. If you are looking at paying points in order to reduce your monthly housing payment, you may want to look at a less expensive property. Fifty one dollars worth of savings isn’t a lot if you are on a tight budget. Chances are that if you have a tight budget to start with, finding extra money for closing would be difficult. And don’t forget, taking out a side loan to get the money to pay points with is defeating the purpose. My suggestion, don’t pay points unless you’re sure it makes sense for you. Author Lester Bleich, NYS Licensed MLO, NMLS #152252Posted on August 25, 2016 Tags Discount Fees, Fees, Finance Points, First Time Homebuyer, home loans, Mortgage Closing Costs, Mortgage Questions, Mortgage Rates, Mortgage Shopping, Origination Fees, Owner Occupied Financing, Payments, Purchase Financing, RefinanceLeave a comment on Does Paying Points On a Mortgage Make Sense? 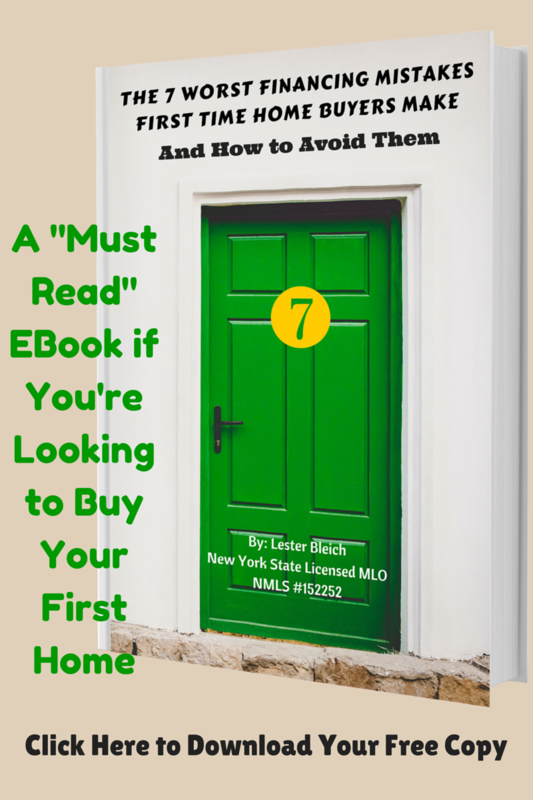 I am excited to release my new EBook for first time home buyers: The 7 Worst Financing Mistakes First Time Home Buyers Make… and How to Avoid Them. Click here or on the picture on the right to download your free copy. 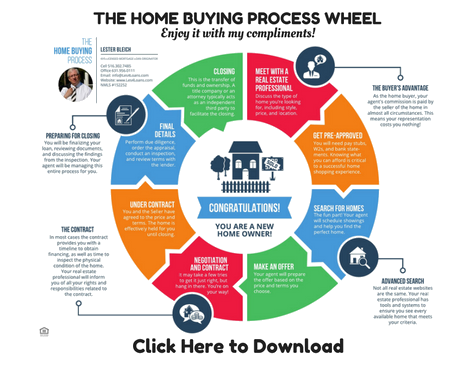 Having originated mortgages for close to three decades, I have found the topics covered in this EBook are the ones first time home buyers want to know about most. 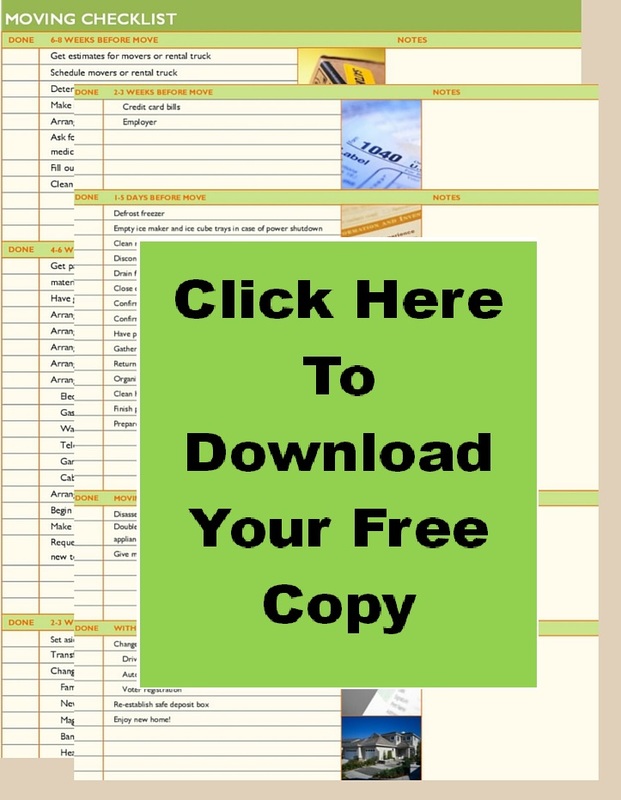 Hopefully, this EBook will help you avoid the mistakes others have made that have cost potential home owners thousands of dollars, and blown up many deals. The download is absolutely free as my gift to you for reading my blog; there is nothing to buy and no commitments to make. Enjoy it, and feel free to pass it on. I wish you much success on your purchase. There are two different rates we’ve always been told to look for when shopping for a mortgage. The first is the Mortgage Interest Rate, which is the rate of interest that will determine your monthly payment. The second is the Annual Percentage Rate, more commonly referred to as the APR. Many people have come to believe that a loan’s APR, is the single most important factor in comparing mortgage loans. However, this is rarely the case, especially in today’s marketplace,” explains Bob Peckenpaugh, Manager of CFIC Home Mortgage. Analyzing the APR during mortgage refinancing or second mortgage loan shopping can be a very tricky proposition. 2) The costs themselves can be manipulated within the loan. For example, prepaid interest (the amount of pro-rated interest a consumer pays at closing for interest which will be earned from that date until the end of the month) can be represented as anywhere from 1 to 30 days, a potentially huge difference, especially on larger mortgage refinancing loans. 4) Lack of industry awareness of what is accurate. Most mortgage loan or refinancing officers do not intentionally try to mislead, but inaccurate information could result in the consumer making a poor decision. As opposed to APR, consumers would be better served by asking the following simple questions. 1) What is the mortgage interest rate? 2) What is the total mortgage loan amount? 3) What is the monthly mortgage payment (principal and interest)? 4) How much are the closing costs? Under new guidelines issued in 2015, within three days of applying for a mortgage, the borrower will receive a Loan Estimate Form that discloses all of the estimated costs of the loan, including taxes and insurance. If you have any questions about anything written here, feel free to contavt me, I will be happy to clarify things for you. Have you ever heard the story of the guy who always held out until tomorrow because he was certain mortgage rates were going to go lower? He waited his entire life and ended up dying with plenty of money, but living in an apartment. Sort of defeats the purpose of saving money to buy a home, doesn’t it? A lot of potential home owners are like this fellow, constantly waiting around for the best deal to come along. They are certain they can wait out the market – little do they realize the market can long outlive all of us! Mortgage rates, with all the dire predictions over the last few years that they will soon be increasing, are still at one of the lowest rate thresholds ever despite weakening economic conditions around the world. There are many reasons for that, and maybe we can address them in a future article. But the fact remains that 30 year fixed rates are about as low as they have ever been. Of course, as with any financial tool, mortgage rates will always be in flux. The good news for many homeowners currently holding mortgages, is that when rates drop substantially, the opportunity is there to refinance into into an even lower rate. It’s almost like being able to have your cake and eat it too! There is no better investment you can ever make than buying a home for your family. Homes are an investment that, over time, will gain in value. Real estate is one of the safest investments you can make. With all the news over the last number of years about the real estate fallout with sub-prime mortgages etc., most consumers who manage their credit and finances correctly can avoid having to deal with any of that. Knowing how much house you can afford, and what payments you can comfortably make will ensure that you don’t become another statistic. A good mortgage broker can help you figure that out. One thing to remember, is that the future value of a dollar is always less. If I gave you the choice of giving you $100 today or $100 next year, the $100 I give you today is going to be worth more and will have more buying power. The same goes with a house – waiting to buy a house because you think the market is too volatile right now could be a big mistake. If your finances are in order and you are on solid ground with your credit, this make the perfect time to take advantage of today’s low mortgage rates and get a great deal in the real estate market. There is no mortgage dilemma. Taking advantage of the rates available today can help you secure your family’s financial future for years to come. Despite all the negative news you might hear about the real estate market, the fact of the matter remains that people who have kept up with their finances are going to benefit greatly from the housing market as it stands today. So why shouldn’t you as well? It doesn’t matter how many times you trawl the internet for information. When looking for tips on taking out a mortgage, you will always be given this advice: compare mortgage quotes. This is the first and most important rule for would-be homeowners. Always compare mortgage quotes. Unless you do, you cannot distinguish the good offer from the bad. Only when you compare mortgage quotes can you assure yourself that you are getting the best possible deal there is. Comparing mortgage quotes, however, is not as simple as pitting one figure against another. You have to factor in other things too. At the same time, you need to have at least a working knowledge of the mortgage terms and realities you will be dealing with. 1. If you want to make comparisons using very accurate data, get quotes from different lenders or brokers on the same day. Mortgage quotes change daily. At times, they even change several times in one day. If you compare a rate you got from one lender on Tuesday to one you got from someone else on Thursday, and rates increased from Tuesday to Thursday, the second lender looks like the better lender, but that may not be the case. 2. When you compare terms, compare mortgage quotes for similar lock periods. A lock period is the specific span of time that guarantees implementation of a certain rate. As a rule of thumb, longer lock periods have higher rates. Lock periods are generally offered in increments of 15, 30, 45 or 60 days. 3. Compare mortgage quotes that have the same points, such as zero or one. In the mortgage business, a point is one percent of the loan amount paid at closing, or with most refinances, added to the loan amount. Three points, for example, means three percent of the loan amount. 4. You should be aware that mortgage quotes follow a tiered pricing. This gives you the opportunity to buy the rate and bring it up or down. How? It’s very simple. To make the points decrease, increase the mortgage rate. To make the points increase, reduce the rate. I only quote zero point loans for my clients, however, there is always an option to pay points and buy down the rate. 5. In the quote you ask for, ask that the quote be separated from standard closing costs to close a loan in your state. Property taxes, home insurance, title charges, appraisal costs, escrows for tax and insurance and prepaid interest are not lender fees. What falls under lender fees are application, processing and underwriting fees. I am happy to say that we don’t charge any of those fees. 1. Locks of 45 days or more have a higher rate. 2. If lenders are asking you to pay points on the loan, be sure to have them quote the points in dollars. This is for your protection. Unscrupulous lenders might later on change the base amount to collect more from you. This is because points are computed as percentages. The bigger the base, the higher the commission, for example. 3. Beware of lenders that are not upfront about the loan process to you. A trustworthy mortgage company is always willing to answer your questions and explain points of misunderstanding. Comparison is good because it highlights the defects of one and showcases the suitability of another. All the reputable websites that dispense mortgage tips will always tell you to compare mortgage quotes. 30 Year vs. 15 Year Mortgage, Which is Best? Discussions of mortgages often focus on interest rates, but there is a much more basic decision to make. Should you go with a 30 year mortgage term or a 15 year mortgage term? Any discussion of mortgages tends to turn on two points. How can you qualify for the most money with the lowest payment, and how can you get the lowest interest rate for the mortgage? While these are two important issues, there is an additional one that people fail to consider, resulting in significant wasted money. The term of a mortgage is extremely critical for a couple of reason. First, it sets the length of the obligation you are undertaking. Second, it defines the amount of interest you are going to pay over the life of the loan. These are huge issues when it comes to building equity, and deciding if a 15 or 30 year mortgage is best for you. The longer the loan, the more total interest you are going to pay. The trade off, of course, is, you are going to have smaller monthly payments the farther you stretch out the obligation. While this may sound like a good goal when you first get the mortgage, it can backfire on you in the long run. Most people focus on interest rates as a way to save money on morgetgas. This is a valid approach, but playing with the length of the loan is a better way to save money. If you can cut the payments in half by going with a shorter loan, you can save huge amounts on the total interest paid to a lender. The decision on the term of the loan is relatively simple, but entirely dependent upon your personal situation. There is no absolute correct choice. First, you need to determine if you can comfortably afford the higher payments that come with a shorter term loan. In general, a 15 year mortgage will have monthly payments 20 to 25 percent higher than a 30 year loan. If you can afford the higher payment, then that is the correct choice for you. By doing so, you will pay the loan off faster, and be building equity in the home quicker. However, if the monthly payment on a shorter term loan will stretch your budget, the more popular 30 year mortgage is best for you. Although you will pay more interest over the life of the mortgage, your monthly payment will be considerably lower. If you do opt for the 30 year loan, make sure the mortgage has no prepayment penalty, allowing you to make extra payments toward the principal balance of your loan, which will not only reduce the total interest you pay over the life of the mortgage, but will also effectively reduce the remaining term of your loan. If you would like me to run an amortization schedule for you that will show how much you will save by making extra payments toward your loan balance, please feel free to contact me. Author Lester Bleich, NYS Licensed MLO, NMLS #152252Posted on April 7, 2016 Tags Amortization, First Time Homebuyer, loan, Mortgage Questions, Mortgage Rates, Mortgage Shopping, Payments, Purchase Financing, RefinanceLeave a comment on 30 Year vs. 15 Year Mortgage, Which is Best? In part one of this two part post, I talked about the benefits and drawbacks of adjustable rate mortgages (ARM), the safeguards built in to most ARMs.in the form of rate caps, and the dangers of negative amortization. In this post, I would like to focus on a few things that you can do to help ensure you’re making the right decision and getting the best deal that you possibly can on your adjustable rate mortgage. Don’t go with the first offer you get. It may sound ridiculous that someone who is making what is often the biggest purchase of their life would jump at the first loan that’s offered to them. But first-time home buyers, who are sometimes surprised that they’ve been offered a loan, can be especially susceptible to this type of knee jerk reaction. Also, lenders who practice hard sell techniques, indicating that the loan rates could change at any moment, can pressure consumers into making quick, ill-advised decisions. You may be thinking, “Of course someone would know the terms of a loan!” This isn’t always the case. When someone is ignorant of the terms of a mortgage, they either haven’t asked the right questions, or after asking a question and getting an answer, they don’t ask for clarification if they’re confused. You must ask questions, understand the answers thoroughly and ask for further explanation if needed. Often information regarding an ARM is given in a simple sequence of three numbers, which may look something like this—3/1/6. In this example, you’re first given the initial cap change of 3, which is the maximum change allowed the first time the rate is adjusted. This maximum is often higher than subsequent changes. The second number represents the periodic change cap. This number, which in our example is 1, is the largest interest rate adjustment allowed during all other changes. The final figure is the life cap or the maximum adjustment that can be implimented during the term of the loan. In our example the life cap is 6, which is typically the highest amount you’ll see for a life cap on a first mortgage. Taking the time to ask yourself this question and answering it honestly can save you a lot of heartache and money down the line, and help you determine if an adjustable rate mortgage is worth it to you. In other words, know the effect a 3 percent rise in the interest rate would have on your pocketbook in the first adjustment period. If you procure a loan with an interest rate that can be altered every six months, could you afford a big spike in the rate? Would your ability to pay and the security of your home be jeopardized by an upward trend in mortgage rates? Look at the actual numbers. Let’s say you’re paying $602 dollars at 4% on an ARM that totals $126,000 and the loan goes to 7% in the first year. Your payment would then be $838 per month or $232 more each month and $2,784 more a year. Remember, that elevated amount only represents the difference in interest and does not include principal, which means suddenly you’re paying a lot more for your house than you intended. How much more? Over the course of a 30-year mortgage you will have paid more than $100,000 in additional interest! That is not a bargain. To help you determine if an ARM makes sense for you, take some time and get the latest information on what is happening with interest rates. Study what’s occurred over the past 12 months and read up on what the experts are predicting. Check the index your potential lender uses to determine if rates will rise, fall or stay stable. Ask the lender what index they utilize to calculate if your mortgage payment will change. They should be able to tell you this and also inform you of the margin, which is the additional amount the lender adds to the index rate. It is usually from one to three points and is constant for the length of the loan. Study the index’s past performance to determine how stable it is and how often it changes. Some indexes will be adjusted monthly. This is an option about which most people do not want to think. However, your first home does not have to be your last home. Buying a less expensive home at a fixed-rate can pay dividends in the next five to ten years. By paying more than interest on a loan, the homeowner benefits in two ways. First, because the consumer is paying principal and not merely interest, they are slowly retiring the debt on the house, building equity and actually becoming the owner of the property. If the owner sells the home ten years down the road, he or she will realize a profit that can go towards the down payment for a bigger and better home. A fixed-rate mortgage also allows you to benefit more from any appreciation in the property. If in ten years, you’ve paid $12,000 in principal on a home worth $100,000 and that same home rises in value by 3% per year, which is a negligible amount, then you would have a home that’s worth about $134,000 and a total gain of $46,000. Imagine how helpful that $46,000 would be in purchasing your dream home! Try to think in the long term when it comes to home ownership. It can pay off in a very short amount of time, especially if you live in an area where property and home prices continue to escalate. So, are adjustable rate mortgages worth it? Although an Adjustable Rate Mortgage may look promising at first glance, it does have its pitfalls. When purchasing a home, carefully consider all of your options, do your homework and think about the future and what will be best for you and your family. An ARM may help you realize the American dream of home ownership; however, securing an adjustable rate mortgage under the wrong circumstances can turn that dream into a nightmare. Refinancing both your first and second mortgages into one low fixed interest rate, will result in one low monthly payment that could save you thousands in interest charges. By combining both mortgages, you qualify for lower rates than if you refinance each separately. You can see a significant savings on your fixed rate second mortgage, which is often several points higher than your first mortgage rate. If your second mortgage is an adjustable rate line of credit (which is usually tied to the prime rate), you will want to get out of that mortgage while the prime rate is still low. This is an excellent time to make that move. You have a couple of options to lower your mortgage payment when refinancing. The first choice is to simply find a new low rate mortgage. Even if you choose the same length for your loan, you will still see a savings in your monthly mortgage bill with a lower interest rate. Adjustable rate mortgages will give you the lowest payments, at least at the beginning of your home loan, but a fixed rate loan will give you the security that they won’t rise in the future. The other option is to extend your loan term, especially in the case of your second mortgage, which usually is for five to ten years. By consolidating your loans to one thirty year loan, you lengthen your payment schedule for principal, so you have a smaller payment. Once you determine the type of loan and terms you want, do your shopping for a good lender to save even more money on your mortgage refinance. Lenders will vary in how much they charge for closing costs and interest rates. The APR will tell you how loans compare overall, both in terms of rates and closing costs. If you are planning to move or refinance again in the near future, then be wary of paying high closing costs. Even if they secure you a lower rate, you will only see a savings if you keep the mortgage for several years. Don’t base your lender decision on posted loan rates. Ask for a personalized loan quote based on your general information. With more accurate numbers, you can make an informed choice as to who has the best financing for you. Mortgage backed securities are securities that are backed by the principle and interest payments on a group of mortgage loans. Lenders group together mortgages and the money that is repaid by the borrowers’ pays investors in the mortgage backed securities. Why Do Mortgage Lenders Issue Mortgage Backed Securities? There are a variety of reasons that lending institutions issue mortgage backed securities rather than holding the mortgage themselves. Most lenders have a limited amount of liquid assets. By selling mortgages they are able to free up money in the short term to make additional loans. Another reason that mortgage lenders sell off their loans as mortgage backed securities is to minimize their risk. Although every effort is made to establish the creditworthiness of an individual before a loan is made, circumstances can change. If a borrower defaults on his mortgage, the lender will have unplanned for expenses just in dealing with repossession and selling of the property. Adding in the lost principal and interest, and a small, local lender could find themselves in a financial mess very quickly. When a lender sells a mortgage as a mortgage backed security, they receive their money up front, both the loaned amount and a percentage of the loan as their fee. The investors in a mortgage backed security then receive income each month, as the borrower pays back the principal plus interest on his loan. There are a variety of mortgage backed securities. The majority of mortgage backed securities are issued by the Government National Mortgage Association, otherwise known as Ginnie Mae, the Federal National Mortgage Association, or Fannie Mae, and the Federal Loan Mortgage Company, or Freddie Mac. These are all groups sponsored by the federal government. While Ginnie Mae is backed by the full faith and credit of the government, and guarantees its investors that they will receive their payments, both Fannie Mae and Freddie Mac have the authority to borrow from the Treasury, which makes them relatively safe investments as well. In addition to the government agencies, brokerage firms and banks often offer mortgage backed securities. These are known as private-label securities. Are Mortgage Backed Securities Risky? Mortgage backed securities are not generally considered a risky investment. To obtain a mortgage, the borrower must go through a qualification process that assures the bank or lending institution that the loan will be paid back. The group who sets up the mortgage backed security will then group mortgages together in order to sell. By pooling the mortgages together, the risk to the investor is minimized. One borrower, who defaults on a loan, or, conversely, pays the loan off early, depriving the group of years of interest payments, will have less of an effect when he or she is a member of a large group. The same borrower, particularly one who defaults on a mortgage, can cause a real financial shock to a small lending institution. Do Mortgage Backed Securities Make a Good Investment? All investment decisions are extremely personal, and will depend on your personal needs. Decisions on investments are best made with help from a financial adviser. For someone who would like a monthly income, a mortgage backed security can be a good choice. A mortgage backed security, particularly one sold by Freddie Mac, Fannie Mae, or Ginnie Mae, can be excellent investment vehicles. In general, the greater the amount of loans held in a mortgage backed security, the safer the investment, because the risk is spread over more people. Before investing in a mortgage backed security, you should find out your expected rate of return. While this can vary, it is nice to know what investors have been receiving. Remember, it is not only loan defaults that can affect your income from a mortgage backed security, but also prepayments and principal only payments. The income from the security is figured on full payment of both principal and interest over the life of the mortgage, typically 15 or 30 years. Any action taken by anyone holding a mortgage in the security can affect your income. It is important to be clear about this with the person you purchase the security from. Mortgage backed securities are an excellent development for borrowers, lenders, and investors. No matter what group you are in, it is important to understand exactly how they work and what you can expect. Before making any investment, ask a financial adviser.